Chilipad Mattress Topper Review - Will Temperature Control Give You Better Sleep? The Chilipad from Kryo Inc. is a mattress pad with a cooling and heating temperature control system. Climate plays a big role in how comfortably we slumber and we all rest at different temperatures, so the Chilipad was designed to help sleepers curate their perfect sleep conditions. Using a network of microtubes, this sleep accessory actively circulates water throughout the pad, regulating the surface temperature of your mattress. Sleepers can adjust the temperature of the water by using a remote control that is synced with control units called “cubes”. This way, sleepers can adjust the temperature of their Chilipads without having to leave the comfort of their beds! The Chilipad offers a Single Zone for folks who sleep alone, and a Dual Zone for those who share their beds with a partner. For this review, I’ll be getting up close and personal with the Dual Zone Chilipad to see if it’s warm enough for a New York winter, and cool enough for even the hottest of sleepers. I hope you enjoy my full review but if you don’t have time you can click here to head to my review summary. SO WHAT AM I SLEEPING ON, ANYWAY? The Chilipad itself is made from a poly cotton top layer, poly cotton fabric on the bottom, and it’s filled with polyester. While your skin won’t be resting directly on the pad, it’s still got a nice soft feel to it. Rolling around on top of the mattress, I couldn’t really hear or feel much of anything and unless it’s turned on, you almost forget the pad is beneath you. Once the water begins circulating through the tubes, you can hear the flow of water if you’re lying down, but the poly cotton fabric itself doesn’t make any noise when you press into it. Inside the pad is a thin tubing through which water is transported from the control unit throughout the pad. The water temperature is regulated within the control unit and you can adjust the temperature by using the remote or using the buttons on the control unit itself. You don’t need to point the remote at the unit in order for it to work; you can adjust the temp from the comfort of your bed. You’ll notice in my set-up guide that I’m only using distilled water. This is not mandatory, but the lack of minerals will help prevent against sediment build-up within the tubes. It’s not a bad idea to use a waterproof mattress protector as well, just in case! The temperature ranges from 55 degrees to 110, so whether you’re a hot sleeper or a cold sleeper, it’s designed so that everybody can find their comfort zone. 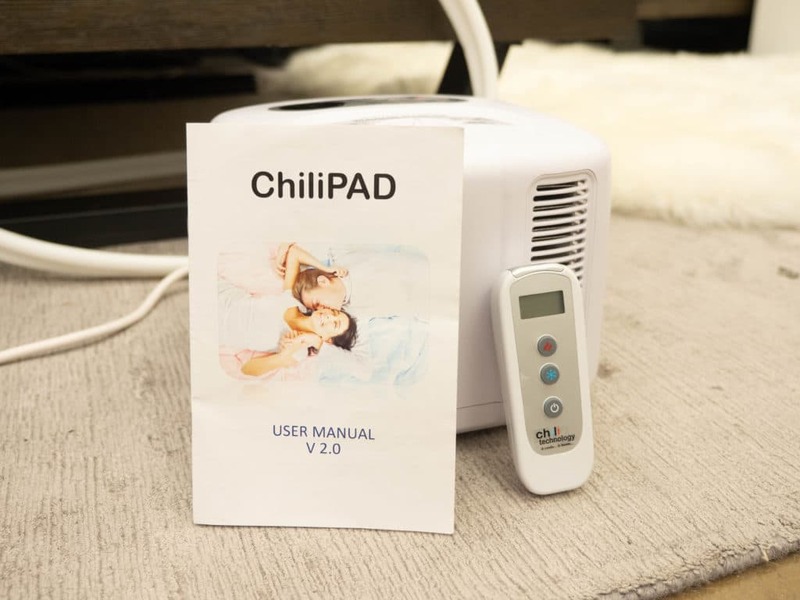 You can order your ChiliPad in either a Single Zone or a Dual Zone. In a Dual Zone, like this one, you’re going to have two control units and remotes instead of one. The microtubes are slightly divided so that you can control the temperature on your side of the bed with your remote, and your partner can control theirs with their remote. The ChiliPad ranges in size from Queen to California King and is said to fit any mattress. The idea is to offer sleep temperature control so you can enjoy conditions exactly how you like them no matter what the weather is doing outside of your bedroom. WHAT DOES THE PAD FEEL LIKE? The mattress pad itself is made from a soft poly cotton fabric that provides a little extra cushion on top of your mattress. The cords that attach from the pad to the units are unobtrusive and easily fastened beneath the fitted sheet. It is recommended that you position the control units at either the foot or the head of your bed so that they are hidden out of the way. The Dual Zone Chilipad is designed with couples in mind as the inner micro-tubing is slightly divided, allowing co-sleepers to enjoy their side of the bed at their preferred temperature. That being said, the tubes are so small that you can’t feel them under your fitted sheet; the idea is to subtly heat or cool you without that feeling of something under you (like can happen with electric blankets). The control units can regulate the water’s temperature in one degree increments so that if you need your side of the bed to be no more or less than three degrees cooler than your partner’s side, it can be! As we know, most folks sleep at different temperatures so this Dual Zone features allows sleepers to sort of personalize their half of the bed. I am definitely very sensitive to temperature when it comes to sleeping — especially falling asleep. 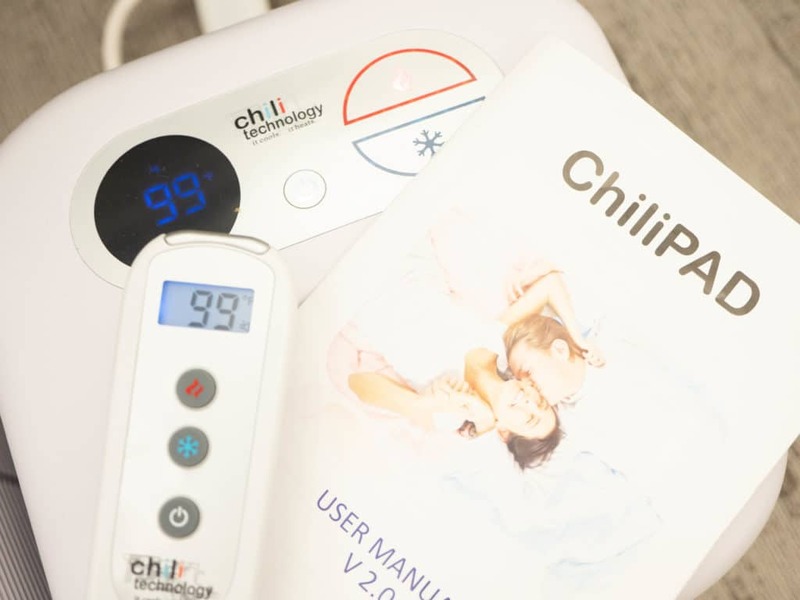 I have a rather small window of what I consider to be “perfect” bedroom conditions, so I was impressed to learn that you can control the heating and cooling features of the Chilipad by single degree increments. Even though I tested this Chilipad by myself, I was excited to see what the Dual Zone was all about. Before unboxing it, I had all kinds of plans to make one side super cool and one side as hot as it could go so that I could bounce back and forth between them like a Turkish Bath. However! Before I could enjoy any of the fun temperature regulation that this Dual Zone Chilipad had to offer, I had to set it up first. I’ll be honest, I’m not the most tech savvy person, so I was a little intimidated at the thought of using remotes and connecting tubes and all that jazz. And I did fumble a few times trying to figure out how to switch the degree setting from Celcius to Farenheit, and making sure the right remote was synced with the appropriate control unit. Turns out, you can only sync one remote at a time (which I would have figured out much sooner with a closer inspection of the instructions). Other than that, set-up is generally intuitive; it was pretty clear which cords needed to be plugged into which outlets. Once I had everything set up and ready to go, I set one side to be 60 degrees, and one side to be 90. About 45 minutes later, the cool side was at 65 degrees and the warm side was at 87. So, I definitely recommend setting your desired temperature before you plan to dive into bed because the temperature does take some time to adjust. Lying in on top of the Chilipad, the cool side felt like I was resting on extra crisp, cooling sheets. I didn’t necessarily feel chilly, but I could definitely feel that my body heat was not being trapped in the mattress at all. Instead, it felt like my warmth was being pulled away, allowing me to cool down from head to toe. As we know, our body’s core temperature needs to cool a bit before we start to sleep, so I felt that if I had the entire pad set to a cooler degree it wouldn’t take long for me to doze off. I rolled over onto the heated side of the pad, and could feel the warmth radiating through the fitted sheet. Again, I wouldn’t say that I felt that scalding heat that you feel from an electric blanket. It felt more like a constant flow of warmth (which is, in essence, what’s happening in those tubes!) and after about 10 minutes of lying there, I did start to sweat. You don’t have to point the remotes in the direction of the control units in order to change the temperature, and I enjoyed being able to adjust the temp without having to move more than a finger. I took the cool side down a few notches and amped the hot side up to 100, because… why not? After 15 minutes, I noticed a slight change in the temperature of each side, but if you lie in the middle of the bed there is a blending of temperatures that goes on. So, if you and your partner like to cuddle in the middle of the bed, you might find that the conditions aren’t exactly as you set them on your side. 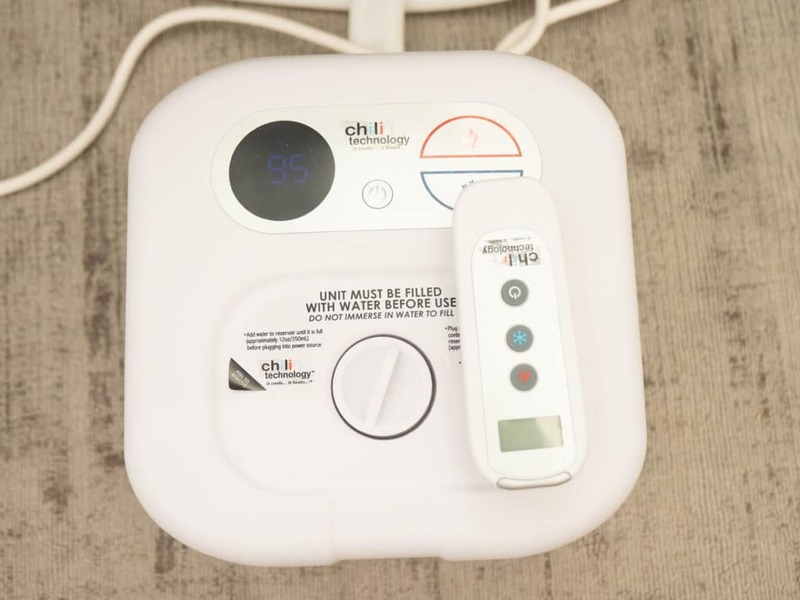 A fun little bonus I enjoyed about the Chilipad is that when it’s turned on, the control units make a gentle whirring sound that I found to be very relaxing. Now, if you’re a light sleeper who needs absolute silence in order to slumber, this white noise factor might not be your cup of tea. I love a soothing white noise, so it enhanced the sleep experience for me! 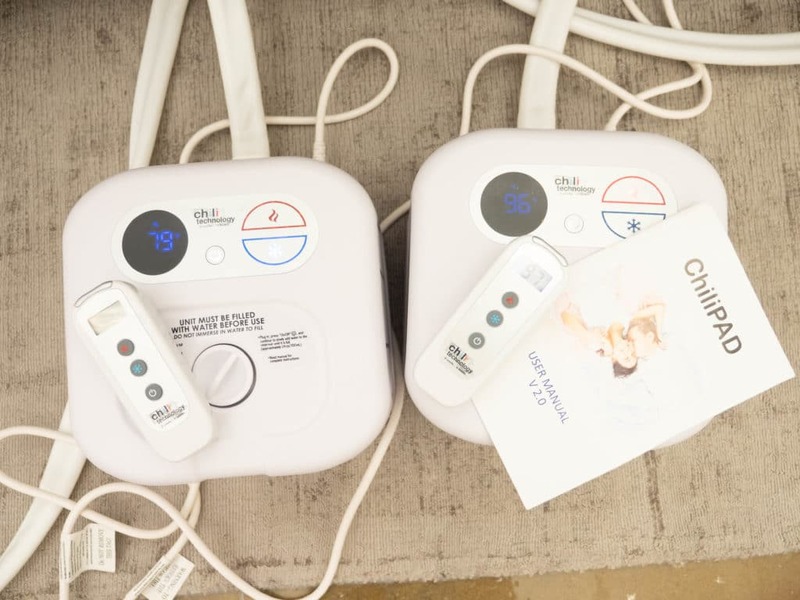 Ultimately, I think the Dual Zone Chilipad is a fun sleep accessory, and could definitely be useful to those who need help regulating temperature during the night. I was a little let down that it never seemed to get super hot or cold; it offered more of a mild, remedying comfort. I could imagine that if I were in bed with a cold, the warming effect would make me feel a lot better. Conversely, because I’m a warm sleeper, I think I would mostly have my Chilipad cranked all the way down to 55 degrees to enjoy a nice cool sleep. Some of you might be wondering how the Chilipad compares to the Bedjet. Well, while they are both designed to control the climate of your mattress, there are a few key differences to note. Water vs. Air — As we know, the Chilipad uses water to either warm or cool the microtubes within the pad. The Bedjet, on the other hand, uses air. So, when thinking about maintenance and overall feel, this is a preference to consider! Over vs. Under — The Chilipad is always positioned underneath your fitted sheet while the BedJet blows heating or cooling air overtop of it. Similar to the Chilipad though, the BedJet does offer purchase of a special Air Comforter that offers some Dual Zone action by creating two independent zones that can be cooled or heated. 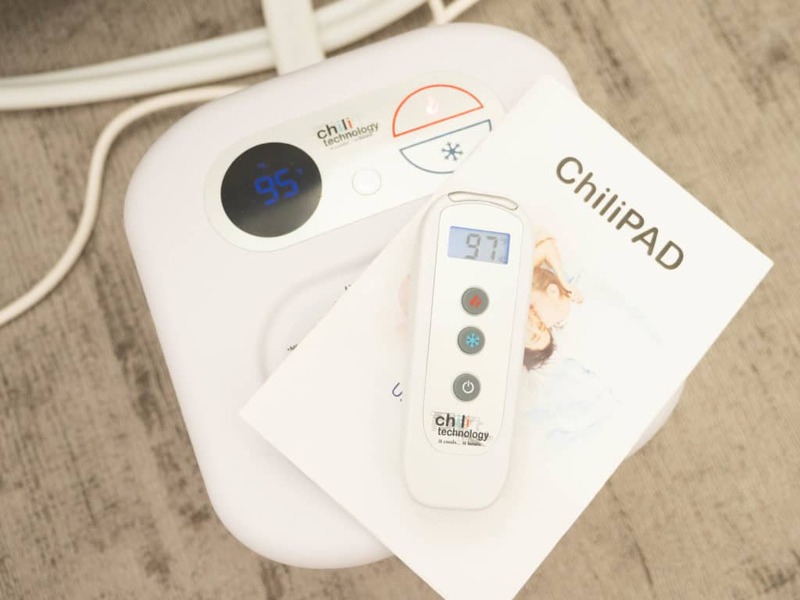 Bluetooth vs. RF Remote — The Dual Zone Chilipad comes with two remote controls which you can use to adjust the temperature of the pad on both sides. The BedJet comes with a remote as well, but you also have the option of downloading their free app and controlling the unit from your smartphone or tablet via Bluetooth. Care Instructions Included — The mattress pads are machine washable on a front load washing machine. Secure the extension tail with a rubber band to minimize the risk of it flailing in the spin cycle. Dry on a delicate no heat cycle or air dry. Batteries Not Included — You’ll need two AAA for each remote. Noise — You can hear the water flowing through the tubes a little bit. It didn’t bother me, but if you’re a light sleeper it’s worth noting. Needs To Be Refilled About Once A Week — Or whenever you see the water in the control unit getting low. Note: The Dual Zone Chilipad, like the one I’m testing out here, ranges in size from Queen to California King. However, single zone Chilipads can come in smaller sizes such as single, twin, twin XL, and full. SHOULD I TRY THE DUAL ZONE CHILIPAD? Shares A Bed — If you love sleeping with your partner, but don’t love how they sleep with the window open in December or with a fleece comforter in the middle of summer, you might really benefit from the Dual Zone Chilipad. The slightly divided micro-tubing allows you and your partner to set different temperatures. Is Athletic — After a long run or tiring workout, active sleepers with swollen muscles could benefit from both the warm and cool healing effects the Chilipad has to offer. Loves The White Noise — The control units emit a quiet, soothing hum when they are turned on, so it’s kind of like having a built-in white noise machine! I GOT MY CHILIPAD! NOW HOW DO I SET IT UP? So, you’ve officially added a Chilipad from Kryo Inc. to your bedroom collection, but you’re not quite ready to enjoy its temperature regulating features just yet! First, you’ve got some setting up to do. Just follow these instructions (and watch my set-up video for guidance) and you’ll be ready to test it out! First thing’s first — before you even unbox your new sleep accessory, make sure you have AAA batteries (you’ll need four for a Double Zone) and some distilled water. The batteries are for the remote controls, and the water is used to fill the control units. Distilled water is used because it’s free of minerals or contaminants which helps prevent against any sediment build-up within the tubes. Okay, so once you’ve got everything you need to get started, place your Chilipad on top of your mattress or mattress protector and then cover it with your fitted sheet. The tubes that connect to the control units should be facing either the foot or the head of your bed (I recommend choosing whichever is closest to an outlet). Connect the pad’s tubes to the back of the control units, plug the control units into an outlet, and you’re ready to fill them with water! When filling the units with water, it’s best to pour a little bit at a time. In order to fill it completely for the first time, each unit is going to take in about 24 ounces of water. You’re able to look in and eyeball how full it is, but if it needs more water, don’t worry — it will beep at you! Remember: don’t try to turn anything on until there is at least a little bit of water inside the units. Once the units are full of distilled water, you’re ready to sync each remote with their respective units. Set the temperature on the unit itself or use the remote control from the comfort of your bed. It’s important to note that the pad can take 20 to 50 minutes to reach the desired temperature, depending on hot warm or cool you want it. If you want to check in on its progress, the display screen on the unit will indicate the current temperature of each zone. And that’s that! Once your Chilipad is set up and ready to go, all that’s left to do is crawl into bed and enjoy the temperature regulating fun of your new sleep accessory.